"NKKK" redirects here. For Nekketsu Kōha Kunio-kun, the first game in the series, see Renegade (video game). For the strategic development company, see Nan'yō Kōhatsu. The Kunio-kun (くにおくん) series is a video game series started by Technōs Japan. The series is now handled by Arc System Works who purchased all of the intellectual property rights from Technōs' spiritual successor, Million Corp. The first game in the series is fully titled Nekketsu Kōha Kunio-kun (熱血硬派くにおくん), which roughly translates to "Hot Blood Tough Guy Kunio", with Nekketsu being the name of Kunio's high school. The kun suffix after his name is an informal Japanese honorific usually applied to young males. The series originated in the arcades and the Famicom console; its title and its protagonist, Kunio (variously renamed "Alex" and "Crash Cooney" in the United States), were named after Technōs Japan's former president, Kunio Taki. Along with that, Kunio also later became Technōs Japan's main mascot, appearing on the company's logo in several games and television commercials. Although the original game was created by Yoshihisa Kishimoto — who later designed Double Dragon — many of the later games (particularly those under the Downtown Nekketsu moniker) were the handiwork of two men: Mitsuhiro "Yoshimitsu" Yoshida and Hiroyuki "Mokeke" Sekimoto. A few of the early Kunio games for the NES were localized for the North American market. These include Renegade, River City Ransom, Super Dodge Ball, Crash 'n' the Boys: Street Challenge and Nintendo World Cup, which were heavily "Americanized" versions of the Kunio-kun games. Technōs Japan has released over twenty Kunio-kun titles for the Famicom, Game Boy, and Super Famicom in Japan. In addition, licensed ports of the games were made for other platforms such as the PC-Engine (through Naxat Soft), Mega Drive (through Pal Soft) and the Sharp X68000 (through Sharp). 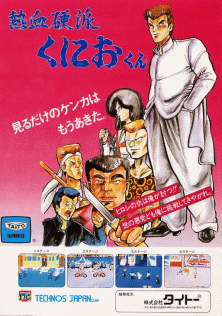 The first game in the series, in the original Nekketsu Kōha Kunio-kun (熱血硬派くにおくん, "Hot-Blooded Tough Guy Kunio") the player takes control of Kunio as he fights against the various gangs who bully his friend Hiroshi at the start of each stage. The international version, titled Renegade, features changed graphics and dubbed voices that gives the game a more western-looking setting. The plot was also changed from Kunio beating gangs to avenge his friend to the main hero having to rescue his girlfriend. Released for the PlayStation 2 in Japan as part of the Ore-tachi Game Center Zoku lineup on January 26, 2006. Based on the Nekketsu Kōha Kunio-kun arcade game, the Famicom version was Technōs Japan's first game for the home console market. The final stage features a maze-like structure in which the wrong path leads to a previous stage. Released in Japan for the Virtual Console on March 18, 2008. Nekketsu Kōkō Dodgeball Bu (熱血高校ドッジボール部) is the second game starring Kunio and the first sports game starring the character. In this game, Kunio leads his school's dodgeball team (Nekketsu High School) as he competes against the rival Hanazono High School, and then proceeds to compete against five international teams (England, Iceland, China, Africa, and America). Released in the United States as Super Dodge Ball, in which the Japanese teams became Americans and vice versa. A port for the X68000 was released on September 1988. Released for the PlayStation 2 in Japan as part of the Ore-tachi Game Center Zoku lineup on March 23, 2006. Nekketsu Kōkō Dodgeball Bu (熱血高校ドッジボール部, Nekketsu High School Dodgeball Club) is the second Kunio game for the Family Computer. The game adds two new teams, India and the USSR. The US version of Super Dodge Ball has the main team as Americans and the final team to be the Soviet Union. Included in the Kunio-kun Nekketsu Collection 1 for the Game Boy Advance in 2005. Released for the Virtual Console in Japan on June 17, 2008. Downtown Nekketsu Monogatari (ダウンタウン熱血物語, Tale of Downtown Nekketsu) is the third Kunio game and the first produced specifically for consoles. Kunio teams up with rival Riki in order to save Riki's girlfriend from the Reihō High School gang. The game is a side-scrolling beat-em-up which combined RPG elements such as buying items and equipment that would increase the player's stats or acquire new moves. Released in North America as River City Ransom and in Europe as Street Gangs. The X68000 version, released on April 1990, features a larger map with more areas and new bosses. The PC Engine Super CD-ROM² version, released on December 24, 1993 in Japan, features an arranged soundtrack in CD-DA format and voice acting. The Famicom version was released for the Virtual Console in Japan on October 23, 2007. This game is part of the Japan-only list of games for the NES Classic Edition. Nekketsu Kōkō Dodgeball Bu: PC Bangai Hen (熱血高校ドッジボール部 ＰＣ番外編, Nekketsu High School Dodge Ball Club: PC Extra Edition) is a special version of the original Dodge Ball which combines the graphics and teams of the arcade version with the emphasis on character-specific statistics and team formation. Features an arcade-style mode and a plot-oriented Quest Mode. Released for the Virtual Console in Japan on September 30, 2008. The fourth Kunio game, Nekketsu Kōkō Dodgeball Bu: Soccer Hen (熱血高校ドッジボール部 サッカー編, Nekketsu High School Dodgeball Club: Soccer Edition) features Kunio and the dodgeball team helping Misako, the manager of the Nekketsu Soccer Club, as they participate in a national soccer tournament against other schools. This is one of the few Kunio games which is not to feature Riki Samejima. Released internationally by Nintendo under the title of Nintendo World Cup, in which game was given a more worldwide theme. Released for the X68000 in Japan on October 1990. Released for the Virtual Console in Japan on October 7, 2008. In Downtown Nekketsu Kōshinkyoku: Soreyuke Daiundōkai (ダウンタウン熱血行進曲 それゆけ大運動会, Downtown Nekketsu March: Let's Go to the Great Athletic Meet) features Nekketsu competing against three other teams (Hanazono, Reiho, and an inter-school union) compete in a series of four athletic events. Up to four players can participate. Released for the PC Engine Super CD-ROM² by Naxat Soft in Japan on July 14, 1992. The Famicom version was released for the Virtual Console in Japan on December 4, 2007. Nekketsu Kōha Kunio-kun: Bangai Rantō Hen (熱血硬派くにおくん 番外乱闘編, Nekketsu Tough Guy Kunio: The Further Brawls) is the first Kunio game for a portable system. Released internationally with changed graphics and music as a Game Boy version of Double Dragon II (unrelated to Double Dragon II: The Revenge). Nekketsu Kōkō Soccer Bu: World Cup Hen (熱血高校サッカー部 ワールドカップ編, Nekketsu High School Soccer Club: World Cup Edition) is a Game Boy version of Soccer Hen based on the international version of the game (Nintendo World Cup). Downtown Special: Kunio-kun no Jidaigeki da yo Zen'in Shūgō! (ダウンタウンスペシャルくにおくんの時代劇だよ全員集合！, Downtown Special: It's Kunio's Period Piece, Assemble Everyone!!) is a follow-up to Downtown Nekketsu Monogatari in which the characters act out a period play. A Game Boy port was released on December 22, 1993 in Japan. This version of the game was re-released for the Virtual Console (3DS only) on June 7, 2011. The Famicom version of the game was released for the Virtual Console on May 12, 2009. Nekketsu Kōkō Dodgeball Bu: Kyōteki! Dōkyū Senshi no Maki (熱血高校ドッジボール部強敵！闘球戦士の巻, Nekketsu High School Dodgeball Club: Fierce Rival! Episode of the Dodge Soldiers) is a Game Boy specific version of Nekketsu Kōkō Dodgeball Bu. It was released for the 3DS Virtual Console in Japan on August 3, 2011. Nekketsu Kōkō Dodgeball Bu: CD Soccer Hen (熱血高校ドッジボール部 ＣＤサッカー編, Nekketsu High School Dodgeball Club: CD Soccer Edition) is a version of Soccer Hen released for the PC Engine Super CD-ROM² by Naxat Soft. This version has add five national teams (France, Brazil, Argentina, Italy and Germany) in Tournament mode which is after beating the final match. It was released for the Virtual Console on November 4, 2008. Ike Ike! Nekketsu Hockey Bu: Subette Koronde Dairantō (いけいけ！熱血ホッケー部「すべってころんで大乱闘」, Go Go! Nekketsu Hockey Club: "Skate, Fall, Great Free-for-All Brawl") centers around Kunio's attempt to help out his school's hockey club. The game was planned to be released in North America under the title of Crash 'n the Boys: Ice Challenge, but was canceled. A teaser of the game was featured in Crash 'n the Boys: Street Challenge. It was released for the Wii Virtual Console in Japan on August 18, 2009. Nekketsu Kōkō Dodgeball Bu: PC Soccer Hen (熱血高校ドッジボール部 ＰＣサッカー編, Nekketsu High School Dodgeball Club: PC Soccer Edition) is a version of Soccer Hen released for the PC Engine HuCard. This version is almost identical to the PC Engine Super CD-ROM² version, but it lacks arranged soundtrack, etc. Bikkuri Nekketsu Shinkiroku: Harukanaru Kin Medal (びっくり熱血新記録 はるかなる金メダル, Astonishing New Records of Nekketsu: The Distant Gold Medal) is a sequel to Downtown Nekketsu Kōshinkyoku. It was released in North America under the title of Crash 'n the Boys: Street Challenge. Downtown Nekketsu Kōshinkyoku: Dokodemo Daiundōkai (ダウンタウン熱血行進曲 どこでも大運動会, Downtown Nekketsu March: The Great Portable Athletic Meet) is a Game Boy-specific version of Kōshinkyoku. Shodai Nekketsu Kōha Kunio-kun (初代 熱血硬派くにおくん, The Original Nekketsu Tough Guy Kunio) is the first Kunio-kun game released for the Super Famicom. It is a beat-em-up RPG set during the end of Kunio's second high school year as he and his friends take a school trip to Osaka. Nekketsu Kōkō Dodgeball Bu: MD Soccer Hen (熱血高校ドッジボール部 ＭＤサッカー編, Nekketsu High School Dodgeball Club: MD Soccer Edition) is a Mega Drive-specific version of Soccer Hen. This is the only version where all the teams are playable in the 2 Player Exhibition Mode. Nekketsu Kakutō Densetsu (熱血格闘伝説, Nekketsu Fighting Legend) is a tournament-style fighting game. Kunio-kun no Nekketsu Soccer League (くにおくんの熱血サッカーリーグ) is the Famicom sequel to Soccer Hen. Bikkuri Nekketsu Shinkiroku: Dokodemo Kin Medal (びっくり熱血新記録！どこでも金メダル, The Astonishing New Records of Nekketsu: Portable Gold Medal) is a Game Boy-specific version of Shinkiroku. It is also features umbrella that replaces Swimming event from the Famicom version. It was released for the 3DS Virtual Console in Japan on November 9, 2011. Kunio-kun no Dodgeball da yo Zen'in Shūgō!! Kunio-kun no Dodgeball da yo Zen'in Shūgō!! (くにおくんのドッジボールだよ全員集合！, It's Kunio's Dodgeball, Assemble Everyone!) is the Super Famicom sequel to the original Dodgeball for the Famicom. Nekketsu! Street Basket: Ganbare Dunk Heroes (熱血！すとりーとバスケット ～がんばれＤｕｎｋＨｅｒｏｅｓ～) is the final Kunio-kun game for the Family Computer. Downtown Nekketsu Baseball Monogatari: Yakyū de Shōbu da! Kunio-kun (ダウンタウン熱血べーすぼーる物語 野球で勝負だ！くにおくん, The Baseball Tale of Downtown Nekketsu: Its a Baseball Match! Kunio-kun) is the third Kunio game for the Super Famicom. This was the first and only game (until Riki Densetsu was released in 2012) in the Downtown Nekketsu series where Kunio is not the main character. Shin Nekketsu Kōha: Kunio-tachi no Banka (新・熱血硬派 くにおたちの挽歌, The New Nekketsu Tough Guy: The Elegy of Kunio and Co.) is the fourth Kunio game for the Super Famicom. It is chronologically set between Nekketsu Kōha Kunio-Kun and Downtown Nekketsu Monogatari. Kunio no Oden (くにおのおでん) is the final Kunio game for the Super Famicom. Nekketsu! Beach Volley da yo: Kunio-kun (熱血！ビーチバレーだよ くにおくん) is the last Kunio game for Game Boy. Kunio no Nekketsu Dodgeball Densetsu (くにおの熱血闘球伝説), known in English as Super Dodge Ball is the final Kunio game released by Technōs Japan before the company went out of business. The game was never formally released in Japan and only saw limited release as an MVS-only Neo-Geo release in North America. The first Kunio game produced by Million. Released in North America as River City Ransom EX. 2-in-1 compilation which includes the Famicom versions of Nekketsu Kōkō Dodgeball Bu: Soccer Hen and Downtown Nekketsu Kōshinkyoku. 2-in-1 compilation which includes the Famicom versions of Downtown Special: Kunio-kun no Jidaigeki da yo Zen'in Shūgō! and Ike Ike! Nekketsu Hockey Bu: Subette Koronde Dairantō. Released in Japan as Chō Nekketsu Kōkō Kunio-kun Dodgeball Bu (超熱血高校くにおくんドッジボール部, Super Nekketsu High School Kunio's Dodgeball Club). Super Dodge Ball sequel developed by Arc System Works. Online game developed by Windysoft which began closed beta testing in 2008 until October 22, 2010. River City Dodge Ball All Stars!! Independently published Dodge Ball game developed by Miracle Kidz, a dōjin group formed by Mitsuhiro Yoshida and Hiroyuki Sekimoto, the original game designers of River City Ransom and most of the other Famicom Kunio games. Trial downloads (in Japanese and English) are available on Miracle Kidz' official site. Released in Japan as Downtown Gekitotsu Dodgeball!, and the second Dodge Ball game developed by Miracle Kidz. Released in Japan as Kunio-kun no Chō Nekketsu! Daiundōkai (くにおくんの超熱血! 大運動会). A follow-up to Downtown Nekketsu Kōshinkyoku developed by Arc System Works. However, the game does not follows the plot of the previous its predecessor. Instead, the game is likely a new storyline than a sequel. This is also the first Kunio game to features Mission mode. Released in Japan as Kunio-Kun no Chō Nekketsu! Soccer League Plus – World Hyper Cup Hen (くにおくんの超熱血! サッカーリーグぷらすワールド・ハイパー・カップ編). A follow-up to Nekketsu Kōkō Dodgeball Bu: Soccer Hen (known as Nintendo World Cup in internationally), although the game is not a direct sequel. Instead, it was continuing from River City Super Sports Challenge, and that Michael Tobioka has returns (along with Stanislav and Sierra). The third Dodge Ball game developed by Miracle Kidz. Unlike the first two Dodge Ball games, Million had involvement in the development of this game. A remake of Nekketsu Kōha Kunio-Kun to celebrate the franchise's 25th anniversary. The game features characters from the Nekketsu Kōha, Nekketsu Kōkō and Downtown Nekketsu series in their Downtown Nekketsu rendition. The Double Tiger Brothers from Nekketsu Kakutō Densetsu, are also featured, as well. A Kunio-kun spinoff, starring Kunio’s rival/partner Riki as the main character. It is also the second game not to feature Kunio as the main character. Released in Japan as Nekketsu Kōha Kunio-Kun SP: Rantō Kyōsōkyoku (熱血硬派くにおくんSP 乱闘協奏曲, Hot-Blooded Tough Guy Kunio SP: Brawl Concerto), it would later be released in other regions by Natsume. Released in Japan as Nekketsu Mahō Monogatari (熱血魔法物語, Hot-Blooded Magic Story), this is a spin-off featuring characters from Downtown Nekketsu Monogatari in a fantasy RPG setting. A follow-up to Downtown Special: Kunio-kun no Jidaigeki da yo Zenin Shugo. Released in Japan as Downtown Nekketsu Kōshinkyoku: Soreyuke Daiundōkai ~All Star Special~, it's a follow-up to Downtown Nekketsu Kōshinkyoku and River City Super Sports Challenge. It's published by H2 Interactive outside Japan. Released in Japan as Downtown Nekketsu Monogatari SP, it is a remake of Downtown Nekketsu Monogatari to celebrate the franchise's 30th anniversary. It also includes a fighting game called Fighting of Double Dragon (Double Dragon Duel in the English version). It was released outside Japan by Natsume. A compilation of 11 classic Kunio Famicom games: Nekketsu Kōha Kunio-kun, Nekketsu Kōkō Dodgeball Bu, Downtown Nekketsu Monogatari, Nekketsu Kōkō Dodgeball Bu: Soccer Hen, Downtown Nekketsu Kōshinkyoku, Kunio-kun no Jidaigeki da yo Zen'in Shūgō!, Ike Ike! Nekketsu Hockey Bu, Bikkuri Nekketsu Shinkiroku: Dokodemo Kin Medal, Nekketsu Kakutō Densetsu, Kunio-kun no Nekketsu Soccer League, and Nekketsu! Street Basket. Released in Japan as Downtown Rantō Kōshinkyoku: Kachinuki Kakutō SP (ダウンタウン乱闘行進曲 かちぬきかくとうSP, Downtown Brawl March: Win Through Fighting SP), it's a follow-up to the Kōshinkyoku / Super Sports Challenge series. It's published by H2 Interactive outside Japan. A compilation of classic Kunio Famicom games, it contains the 11 games from Kunio-kun Nekketsu Complete: Famicom Hen as well as the western versions of Renegade, Super Dodge Ball, River City Ransom, Crash 'n' the Boys: Street Challenge, Double Dragon, Double Dragon II, and Double Dragon III. Online play has been added to all of these titles. A brawling game that is an updated version of Kachinuki Kakutō SP. The following is a list of characters appearing in most of the games, ordered by the games where they first appear. Kunio as he appears in Downtown Nekketsu Monogatari EX. In the US version (River City Ransom EX), he is known as Alex. Kunio (くにお) – The protagonist of the series. Kunio serves as the guardian of Nekketsu High School against rival schools and is the captain of his school's Dodgeball team, although he excels at other sports (such as soccer and hockey). Kunio first appears in the original Kunio-kun, where he is described as a second year student at Nekketsu High School (in the Downtown Nekketsu sub-series, he is described as a third year student, establishing a loose continuity between later games). His surname is never revealed. However, the upcoming live-action movie and television series reveal his last name as Fu'unji. In some games (such as Nekketsu Hockey Bu and Baseball Monogatari), he is the only student at Nekketsu to wear an all-white uniform, while at other games everyone at Nekketsu wears white. In the localized versions, he is known as a nameless vigilante in Renegade (Mr. K in the NES version), Sam in Super Dodge Ball, Alex in River City Ransom and some of its ports, and "Crash" Cooney in Crash 'n the Boys: Street Challenge. While the protagonist of the series, Kunio also later became Technōs Japan's main mascot, appearing on the company's logo in several games and television commercials. Kunio is voiced by Ryō Horikawa in most of games, and while in Dodgeball Bu: CD Soccer Hen, voiced by Hiroyuki Satō. Riki Samejima (鮫島 力, Samejima Riki) – Often described as Kunio's eternal rival, Riki is the guardian of Hanazono High School and the second most recurring character in the series. In the original Kunio-kun, Riki appears as the first stage boss and serves as captain of the Hanazono dodgeball team. Nekketsu Monogatari was the first game where Riki teams-up with Kunio (although chronologically speaking, Shodai comes first). Since then, Riki's relationship with Kunio evolved from enmity to close friendship, and he appears in the later beat-em-ups as a secondary playable character. Riki's birthdate is on May 5 and is repeating his third year in the Downtown Nekketsu sub-series. In the localized versions, he is known as Jack in Renegade and Super Dodge Ball, Ryan in River City Ransom, and Crusher in Crash 'n the Boys: Street Challenge. Riki is voiced by Nobutoshi Canna in PC Engine version of Downtown Nekketsu Monogatari and Masaaki Okura in Nekketsu Dodgeball Densetsu. Hiroshi (ひろし) – Hiroshi is Kunio's best friend in the original Kunio-kun game. He enrolls into Nekketsu High School during his second year and gets picked on a lot by bullies. He becomes fast friends with Kunio after Kunio defends him from his tormentors. In the arcade version of Kunio-kun, he is beaten by a different gang at the beginning of each time, whereas in the Famicom he is kidnapped by Sabu (with no explanation given). In addition to the Nekketsu Kōha sub-series, he appears as a member of the Dodgeball Club in Dodgeball Bu, as well as in Soccer Hen and Hockey Bu, where he shares the same sprite as the Sonokawa character from the Downtown Nekketsu sub-series (until he receives a new sprite in Kunio-kun Special). He is the only character not to appear in the American versions of the Renegade games. Shinji – The leader of a bōsōzoku gang known as "Yokohama Funky" in Kunio-kun (where he is the second stage boss) and the "Blue Emperor" in Kunio-tachi no Banka (where he is a recurring boss). He also appears as a playable character in the Neo Geo version of Super Dodge Ball. His counterpart in Renegade is named Joel. Shinji is voiced by Hisao Egawa in Nekketsu Dodgeball Densetsu. Misuzu – A giant sukeban from the Taiyō Academy, an all girl school. She first appears as the stage 3 boss in Kunio-kun. She reappears as Sabu's bodyguard in Kunio-tachi no Banka and as a playable character in the Neo Geo version of Super Dodge Ball. Her counterpart in Renegade is named Kim. Misuzu is voiced by Keiko Yamamoto in Nekketsu Dodgeball Densetsu. Sabu – The leader of a yakuza gang known as the "Sanwakai" (三和会). He is the gun-wielding final boss in the original Kunio-kun. He returns as the main antagonist in Kunio-tachi no Banka, where he hires a Kunio look-alike named Ken to frame him for a hit and run accident. In Nekketsu Kōha Kunio-Kun SP: Rantō Kyōsōkyoku (River City: Tokyo Rumble), Sabu orchestrates a plan to conquer Tokyo and get revenge on Kunio for defeating him in the past by establishing the "Tokyo Lion Alliance". He is also a playable character in the Neo Geo version of Super Dodge Ball. Sabu is the only character not to change his name, nor his appearance, in Renegade. Sabu is voiced by Yukimasa Kishino in Nekketsu Dodgeball Densetsu. Kōji – In Kunio-kun Special, Koji is the captain of Nekketsu High's Soccer Team, but would later surrender his position to Kunio. He reappears in Shodai Nekketu Kouha Kunio-kun as among the students visiting Osaka. Heilman – Captain of the Iceland team. Njomo – Captain of the Kenya team. Morudofu – Captain of the USSR team who debuted in the Famicom version of Dodgeball Bu. Mami Shimada (島田 真美, Shimada Mami) (Cyndi in River City Ransom) – Mami is a 2nd Year High School Student of Hanazono High. In River City Ransom, she is Riki's girlfriend who is kidnapped by Yamada when he and his gang took over River City. She is also the cheerleader of the Hanazono team. Kazumi Hasebe (長谷部 和美, Hasebe Kazumi) (Roxy in River City Ransom) – Hasebe is a 3rd Year Student of Reihou Academy. She is the girlfriend of Yamada in River City Ransom and warns Kunio and Riki of the Hattori Twins. She is also the Student Vice President of Reihou Academy. In Downtown Nekketsu Baseball Monogatari, she plays as the sports commentator for the game. It is said that she, Kunio, and Yamada used to attend the same school together before Kunio transferred to Nekketsu High. Kaoru Sonokawa (園川 薫, Sonokawa Kaoru) (Harry in River City Ransom, Conan in River City Ransom EX) – 2nd Year student of Senridai High School. In an effort to make a name for himself and his school, he attacks Hanazono High, but is constantly defeated by Riki. In other Kunio-kun games, he plays as Kunio's sidekick. Tsuneo Kamijō (上條 恒男, Kamijō Tsuneo) and Noriyuki Yamamoto (山本 憲之, Yamamoto Noriyuki) (Benny and Clyde in River City Ransom) – Co-leaders of Kagemura Academy. Yasuo Sawaguchi (沢口 靖夫, Sawaguchi Yasuo) (Moose in River City Ransom) – Self-proclaimed No. 2 man of Hakutaka Industry High School. He is the game's first boss. Naritaka Nishimura (西村 成孝, Nishimura Naritaka) (Rocko in River City Ransom, Baldy in Crash 'n the Boys: Street Challenge) – The No. 1 man of Hakutaka Industries High School. Despite his plump size and wearing large glasses, Nishimura is a formidable fighter. Masao Kobayashi (小林 政男, Kobayashi Masao) (Thor in River City Ransom, Monty in Crash 'n the Boys: Street Challenge) – Leader of the "Four Devas" (Zombies in the English version), a group of some of the most feared fighters from Reihou Academy under Onizuka. Shun Mochizuki (望月 駿, Mochizuki Shun) (Turk in River City Ransom, Wheels in Crash 'n the Boys: Street Challenge) – One of the "Four Devas" of Reihou Academy. Known for his quickness in combat. Kiyofumi Taira (平 清文, Taira Kiyofumi) (Mojo in River City Ransom) – One of the "Four Devas" of Reihou Academy. Tadashi Kinoshita (木下 忠, Kinoshita Tadashi) (Blade in River City Ransom) – One of the "Four Devas" of Reihou Academy, he also controls Hakutaka Industries High School. Tsuyoshi Gōda (豪田 剛, Gōda Tsuyoshi) (Ivan in River City Ransom, Sprecks in Crash 'n the Boys: Street Challenge) – Student of Horyou High School, he guards the entry gates of Reihou Academy. Although a tough fighter, he has a kind heart and has a sense of justice. Takashi Onizuka (鬼塚 崇, Onizuka Takashi) (Otis in River City Ransom) – Guards the Gymnasium of Reihou Academy. He is the former Student President of Reihou Academy and leads the "Four Devas". Susumu Godai (五代 奨, Godai Susumu) (Tex in River City Ransom, Clint in Crash 'n the Boys: Street Challenge) – Boss of Tanihana High School, he guards the school hallways leading to the floor where Mami is held. He admires Goda's persona. In other Kunio-kun games, he is a friend to both Kunio and Riki. Ryūichi Hattori (服部 竜一, Hattori Ryūichi) and Ryūji Hattori (服部 竜二, Hattori Ryūji) (Randy and Andy in River City Ransom) – The Hattori Brothers. They are also known as the "Double Dragon Twins" due to not just their resemblance to Billy and Jimmy Lee, the protagonists of the Double Dragon games (being twin brothers, having the same special moves, and having the Double Dragon Theme song played whenever they appeared), but also because of their names (Ryuichi and Ryuji can be translated as "First Dragon" and "Second Dragon"). They are the strongest fighters of Reihou Academy and are the fiercest opponents of Kunio and Riki. Aside from River City Ransom, the twins appeared in other Kunio games either as bosses or representing Reihou Academy as co-team captains. Taiki Yamada (山田 大樹, Yamada Taiki) (Slick/Simon in River City Ransom, Skip in Crash 'n the Boys: Street Challenge) – The final boss of River City Ransom. Also the previous Student President of Reihou Academy. His reason for kidnapping Mami was to lure out Kunio and defeat him in order to become the franchise's new main character. In other games, Yamada plays more of a comical sidekick to Todou. Yamada, along with Kunio and Hasebe, used to attend the same school together before Kunio moved to Nekketsu High. Yamada is voiced by Wataru Takagi in the first two Downtown Nekketsu games for the PC Engine Super CD-ROM². Misako (みさこ) – A student of Nekketsu High, Misako is the manager of the school's Soccer Club in Nekketsu Kōkō Dodgeball Bu: Soccer Hen and asks Kunio for his help after some members of her team who got food poisoning and end up being taken to hospital. In Kunio-tachi no Banka, she is Kunio's fighting partner. Misako is voiced by Yumi Tōma in Dodgeball Bu: CD Soccer Hen. Takashi (たかし) – Goalkeeper for Nekketsu High's Soccer Team. He and Misako sought Kunio's help in leading the team to the championship. Masa (まさ) – A 9th member of Nekketsu High's Soccer Team. Gen'ei (げんえい) – A last member of Nekketsu High's Soccer Team, who joins Kunio and his team after they won in semi-final match. He reappears in Shodai Nekketsu Kouha Kunio-kun as among the students visiting Osaka. Takayuki Yoritsune (よりつね たかゆき) – Captain of Hattori Academy's Soccer Team from the semi-final match. He, and other team captains from the game, would later join Kunio to represent Japan in Nekketsu Soccer League. His handsome looks and superb skill has made him popular among female students. The same guy later returns in Super Sports Challenge as an unlocking team and again, reprises his role as the member of Nekketsu FC team in Soccer Hooligans. He also appears in Kunio-kun Special. Mamoru Tōdō (藤堂 護, Tōdō Mamoru) (Todd in Crash 'n the Boys: Street Challenge, Titus in River City Ransom EX) – The current Student President of Reihou Academy. A man of extreme wealth, he has a huge dislike for Kunio and makes attempts to humiliate him in Downtown Nekketsu Kōshinkyoku, and Crash n' The Boys Street Challenge. He is Yamada's superior after the latter surrendered his title of Student President to him in the aftermath of River City Ransom. Tōdō is voiced by Hikaru Midorikawa in Downtown Nekketsu Kōshinkyoku (PC Engine Super CD-ROM² version). Sanjūrō Sugata (姿 三十朗, Sugata Sanjūrō) (Cheese in Crash n' The Boys: Street Challenge, Gary in River City Ransom EX) – 2nd Year Student of Nekketsu High. Like Hiroshi, he is a friend of Kunio and looks up to him for inspiration. He becomes the protagonist in Downtown Nekketsu Baseball Monogatari as the leader of the Nekketsu High Baseball team. Haruka Nanase (七瀬 遥, Nanase Haruka) – 2nd Year Student of Nekketsu High. He is Sugata's classmate. In Baseball Monogatari, he becomes the vice-captain of the Nekketsu High Baseball team when Sugata replaces Tachibana as team captain. Noboru Takamine (鷹峰　昇, Takamine Noboru) – Freshman from Nekketsu High and member of the school's Judo club. Kenichi Morimoto (森本　健一, Morimoto Kenichi) – Another Freshman from Nekketsu High and a member of the school's Drama club. Satomi Momozono (桃園 里美, Momozono Satomi) – 2nd Year Student of Nekketsu High. She is the school's cheerleader and is also a childhood friend of Sugata. Like many of the franchise's female characters, she too has an interest in Kunio. She is a playable character in Nekketsu! Beach Volley da yo: Kunio-kun. Hikaru Saotome (五月女 光, Saotome Hikaru) (Nate in Crash n' The Boys: Street Challenge) – 2nd Year Student of Hanazono High. He is known for his handsome looks and is Sugata's rival. Tōru Maeda (前田 亨, Maeda Tōru) (Rick in River City Ransom EX) – 3rd Year student of Hanazono High and former rival of Riki. Ryōma Hayasaka (早坂 良麻, Hayasaka Ryōma) (Knors in Crash n' the Boys: Street Challenge, Jesse in River City Ransom EX) – A student of Reihou Academy. He is a close friend of Shun Mochizuki. Shizuka Aihara (藍原 静, Aihara Shizuka) – 2nd Year student of Reihou Academy and is the team's Cheerleader. She has an older sister named Megumi, who is an art teacher at Nekketsu High. Jūzō Kumada (熊田 重蔵, Kumada Jūzō) (Barns in Crash n' The Boys Street Challenge, Ted in River City Ransom EX) – A member of the Judo club from Torashima Industries IV High School. He is in his 3rd Year. Takeshi Hayami (速水 武士, Hayami Takeshi) (Milo in Crash n' The Boys: Street Challenge) – 2nd Year student of Hayabusa High. Yūko Kirishima (霧島 裕子, Kirishima Yūko) – 2nd Year student of Horyo High and is the cheerleader of the School Alliance team. She has a close relationship with the Gouda siblings. Yoshihiro (よしひろ) – A main antagonist of Shodai. An exchange student from Osaka studying at Nekketsu High. He invites Kunio and the gang to Osaka as part of a school trip during their second year. After Hiroshi was beaten by the students of Union at early in the game, Yoshihiro joins the Osaka Alliance to avenge him. However, it is later revealed that Yoshihiro is a new leader of Osaka Student Union and mastermind behind who obey the gang to dominate and taking over Japan. After he betrayed both Nekketsu High and Osaka Alliance, It is also reveals that he responsible for locked the Union's old leader and orders Urabe (from Ebisu High) to captured Miho during the sewer basement. Miho Yanagisawa – 2nd year student of Sakurakyou High School. A friend of Hiroshi's, she warns Kunio of the Osaka Student Union, a gang of juvenile delinquents, and their plan to take over Japan. Masaki Yanagisawa – One of the four Osaka Student Union's heavenly kings, and Miho's older brother. Yōichi – He is the team captain of Nekketsu High's Hockey Team. He seeks Kunio's help in improving and strengthening the Hockey Team and win the championship. He also makes a cameo appearance in the opening intro of Nekketsu Kakutō Densetsu. Kaori – Reporter for Nekketsu High's school newspaper. She provides reports of the Hockey Team's progress in the game and is secretly in love with Yoichi. Tooru – Captain of Nekketsu High's Kendo Club. Youko – Captain of the Yurikaoka Hockey Club as well as the Association of Magic. A hard working student, she is a good friend of Kunio and accepts the latter's challenge to a hockey match. Tobiyama (とびやま) – Captain of the Daisetsuzan High School Hockey Club. He and his team fought against Team Nekketsu during the final match in Scenario Mode. His extraordinary skill allowed him to be drafted as a professional player for the Canadian Team. This character would later appear in Super Sports Challenge, and Kunio-Kun Special. Johnny (ジョニー, Jonī) – Student of the Oklahoma High School team. He reappears in Nekketsu Dunk Heroes as one of the participants and as a friend to Kunio and Riki. Raphael (ラフェール, Rafēru) – Another student of the Oklahoma High School team. Jimmy (ジミー, Jimī) – Also a student of the Oklahoma High School team. He shares the same sprite and moveset as the Hattori Twins, though with a different color. In Super Sports Challenge, his design was completely different rather than shares as Hattori Twins. It is unknown if he is actually Jimmy Lee, one of the protagonists of Double Dragon. Kounosuke Todou – Father of Mamoru Todou and President of the Toudou Group. Upon hearing of his son's defeat by Kunio, Kounosuke helped organize the tournament in Bikkuri Nekketsu Shin Kiroku. Toraichi and Toraji – They head the tournament in Nekketsu Kakutou Densetsu waiting to fight the strongest opponents in the game. Also called the "Double Tiger Brothers" and "Saber Tigers" because of them being both twins and wear Tiger Masks in combat. They later show up in Super Sports Challenge as the captains of Martial Arts team, and Kunio-kun Special. Before arrived in Modern-era, they also make a small cameo appearance in Kunio no Oden in the Vs. Mode screen. Tatsumi Tachibana (立花 辰巳, Tachibana Tatsumi) – An honor student and a superb athlete, he is the team captain of Nekketsu High's Baseball team. An injury on his shoulder bars him from leading Nekketsu High to Japan's National High School Baseball Tournament. This serves as a catalyst for Sugata to take his place as team captain. Rika Asano (浅野 里佳, Asano Rika) – Rika is referred to by her given name. She is the team manager of Nekketsu High's Baseball team and is Tatsumi's girlfriend. News of Tatsumi's injury leaves her heartbroken and unable to fulfill her duties as team manager. This motivates Sugata, who has a crush on her, to lead the Nekketsu team in the baseball tournament. Kuniko Ashino (芦野 久仁子, Ashino Kuniko) (Shel in River City Ransom EX) – Kuniko is referred to by her given name. She takes over Rika's place as team manager of Nekketsu High's Baseball team. She is also Kunio's biggest fan and chases him whenever the opportunity arises. She has a rivalry with Hasebe. Kōjirō Murasaki (紫 小次朗, Murasaki Kōjirō) – 3rd Year student of Horyo Academy. His flowing violet hair and skills with the sword earned him the nickname "The Beautiful Swordsman". Gouda's sister, Saori, is in love with him. Raiji Tsuge (柘植雷二, Tsuge Raiji) – 3rd Year student of Fukubu Academy. He is Murasaki's childhood friend as well as his rival in terms of skills with the sword. His skill in the martial arts also rivals that of the Hattori Twins. Tsukasa Mochizuki (望月司, Mochizuki Tsukasa) – Freshman student of Fukubu Academy. He is the younger brother of Shun Mochizuki, one of the bosses in River City Ransom. Ken – Kunio's lookalike. He is hired by Sabu to frame Kunio for a hit-and-run accident that landed the latter and Riki into jail at the beginning of the game. Kyōko – A student of Hanazono High, she is Riki's fighting partner in the game. There is conflict that she is Riki's girlfriend, which contradicts his relationship with Mami in River City Ransom. Shō Himada (火間田 翔, Himada Shō) (Rex in River City Ransom EX) – A member of Torashima Industries IV High School's Cheerleading Club. Saori Gōda (豪田 砂織, Gōda Saori) (Abby in River City Ransom EX) – Saori is referred to by her given name. Younger sister of Tsuyoshi Gōda. Michael Tobioka – A founder of the Tobioka Conglomerate, who find an interesting guy named Kunio on Internet, so he sending the letters to him (and other) for his challenge. He later appears in Soccer Hooligans alongside Sierra and Stanislav. However, the game is revealed after the events of Super Sports Challenge when Tobioka CC team were failed in the final tournament. Tomorin (ともりん) – A idol of Arc TV. Sierra (シエラ) – A Michael Tobioka's aide. Stanislav – A scientist, who working for Tobioka Conglomerate. Yuya & Toshio – Students of Class 2-E from Nekketsu High. They are first seen bullying Hiroshi at the back of the school in the beginning of the game. After suffering defeat by Kunio twice, they seek help from Hanazono High. Madoka – Kunio's teacher from Nekketsu High. Kouchyo – Principal of Nekketsu High. Wataru – The No.2 man of Hanazono High. He is approached by Yuya and Toshio who seek help in defeating Kunio. Sakata – 3rd Year Student of Hanazono High. Serves as a subordinate of Riki. Megumi & Gonda – Teachers of Hanazono High. Mikoto – A subordinate of Shinji and member of the Blue Emperor gang. Okada – Leader of the "Mushamonzen" (武赦紋漸) gang consisting of 50 people. Believed to be responsible for Riki's frame-up in the game. Shirogane – Member of the Tokyo Lion Alliance who holds the title "Silver Lion". He originally ran in Shinji's Blue Emperors until his close friend died in a motorcycle crash. Oda – Member of the Tokyo Lion Alliance who holds the title "Demon Lion". A muscular man wearing a hockey mask, Oda does not talk much but lets his strength speak for itself. Benibayashi – Member of the Tokyo Lion Alliance who holds the title "Rouge Lion". The only female leader, she uses her beauty and ballerina-trained movements to beguile enemies. Ukyo Azuma & Sakyo Azuma – Members of the Tokyo Lion Alliance who hold the title "Twin Lions". Identical twins (save for Ukyo's facial scar) who move and fight in perfect sync. Kaneda – Member of the Tokyo Lion Alliance who holds the title "Gold Lion". A successful businessman with a love for fighting, he joined the Lion Alliance solely for personal amusement. Shigematsu – Leader of the Tokyo Lion Alliance who holds the title "Ultra Lion". He plans to lead the Lion Alliance into ruling all of Tokyo. Lee – Sabu's older brother, who runs the Triads in Hong Kong. He and Sabu orchestrate a plan to get revenge on Kunio for his previous humiliation of the Sanwakai by establishing the Tokyo Lion Alliance. A gag manga based on the video games was produced titled Ore wa Otoko Da! Kunio-kun (おれは男だ! くにおくん). The manga was illustrated by Kosaku Anakubo and was serialized in the monthly anthology CoroCoro Comic from 1991 to 1996, lasting 11 collected editions. Ore wa Otoko Da! was awarded the Shogakukan Manga Award for children's manga in 1995. ^ "Yahoo!ゲーム – iアプリ『熱血高校ドッジボール部対戦版』が本日配信スタート！" (in Japanese). ^ "体験版を独占配信！ 熱血硬派ACTの名手・よしみつ吉田氏が本格始動!! :" (in Japanese). ^ "Miracle Kidz／ミラクルキッズ！ ダウンタウン ドッジボールだよ全員集合!!" (in Japanese). ^ "[NDS] くにおくんの超熱血! 大運動会 [NDS] / ゲーム – Neowing" (in Japanese). ^ 小学館漫画賞：歴代受賞者 (in Japanese). Shogakukan. Archived from the original on 2007-09-29. Retrieved 2007-08-19.